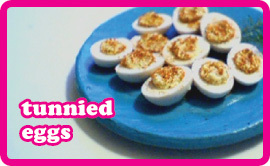 The name of this dish sounds appauling, I have no idea what ‘Tunnied’ is but I was unsure that I wanted it done to my eggs. On further inspection it’s a kind of stuffed egg. It’s is a great way to make a stand out starter. They’re pretty simple and the great flavour of capers make it really delicious. This will make enough for 6 people. Cut the eggs in 1/2 vertically and remove the yolks to a mixing bowl. Add the tuna to the bowl with the anchovy paste and mash well together. Add the mayonnaise, capers, parsley and a little freshly ground black pepper and mix well. Take a 1/2 tablespoon measure of the mixture and fill the egg whites. On a small bed of lettuce with 2 1/2 eggs per person.